The British-born Clark was a Canadian college star, playing as a wide receiver as well as punting and placekicking. He was a four-time Atlantic Conference All-Star, leading the conference in scoring with 85 points in 1973, the same year in which St. Mary’s won the Vanier Cup as Canadian national champions. While drafted in the first round by the Hamilton Tiger-Cats of the CFL, Clark chose to sign with the Storm of the new World Football League for 1974. Storm went 7-12-1 to finish third in the WFL Western Division. 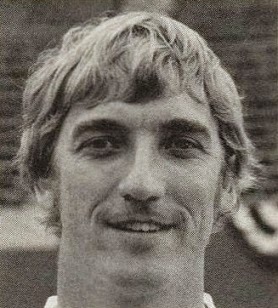 Clark moved on to the CFL in 1975, signing with Hamilton. He led the league in punting, averaging 43.8 yards in his first year with the Tiger-Cats, and remained with them until five games into the ’78 season, when he was obtained by Toronto, occasionally backing up as a wide receiver (he had highs of 14 catches and 229 yards in 1977) and placekicking in 1976. He again led the CFL in punting in 1976 and ’77 and the Eastern Conference in ’78 and was an Eastern Conference All-Star in 1977 and ’78. Clark joined the Los Angeles Rams of the NFL in 1979, where he averaged 40.1 yards on 93 punts and was part of the NFC Championship team that went to the Super Bowl, but after being cut during preseason in ’80, he returned to the CFL for another eight years with Saskatchewan and Ottawa. Clark led the CFL in punting twice more and was a Western All-Star in 1982 and an Eastern selection in ’85 (and All-Canadian in both). Overall, in 12 CFL seasons he averaged 45.1 yards, the third-best career average in league history as of 2010.